Having bounced from a bedroom-DIY debut that brought a Mercury Prize nomination, to a follow up they seem to have dismissed as an uninspired blip, Django Django – an almost impossible band to peg – are back with a third album, ‘Marble Skies’, and heading for Dublin..
Django Django have been hovering around the edges of a burgeoning indie scene for years, hard to define but easy to love. They draw in aspects of straight-up indie rock, electro-punk, mild psychedelic tendencies and plenty of varied, often-sampled beats. 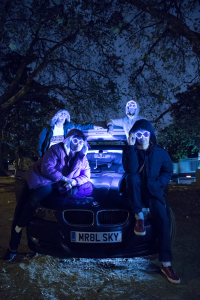 The entire concept seems to hang on limitless experiment, something that’s evolved strongly through their careers, and now revolves around a large practise room in Tottenham (North London), crammed with their monstrous vinyl collection and all the instrumentation they need. There’s a sense, in fact, that Neff wasn’t all that happy with Django Django’s second album, which saw the act shift to the ‘big time’ but perhaps become a little less themselves. They moved from a very-much bedroom recording set up in their 100,000-selling self-titled debut, to a high-end studio production in sophomore release ‘Born Under Saturn’. 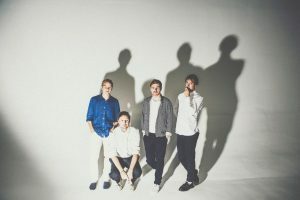 Based on the reception of its early singles and the first few days of the new album, it seems likely the Marble Skies will be the popular return to form that Django Django were looking for. The critics are certainly infatuated, if continuing a charming and convoluted struggle to pin down exactly what this band actually are. Django Django play the Tivoli Theatre on Francis Street on March 2. Their acclaimed third album ‘Marble Skies’ is out now.